I feel like I have the unpopular opinion that 2016 was actually an amazing year. For me it was a year of growth, change, learning, and new adventures, which I hope will all continue in 2017. With that said, it's that time where I review my year in costumes and go over my plans for the new year. 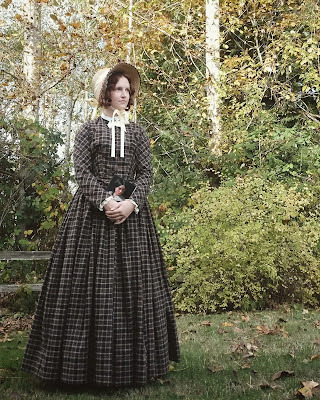 This year I really got into the historical side of costuming, which is something I've wanted to do since I started sewing all those years ago, and it turns out I really, really love it. The reason it took me this long to get into it is because it intimidated me. But between having already started m first Victorian dress at the beginning of the year and going to Costume College I got quite a bit of historical sewing in this year. I'm not going to go through my costumes in date order because quite frankly, I don't remember what I made when and because I've been horrible at blogging (something I want to work on next year) and I really don't know which pieces came first. So with that said, let's get started. 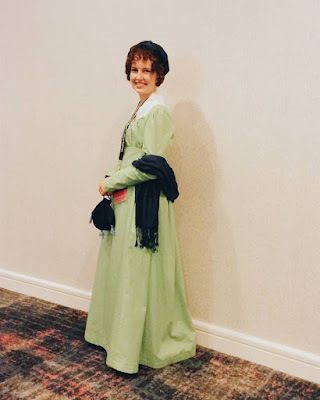 I completed my first Regency dress, and I loved it! I (finally) finished my 1871 bustle dress and got to wear it to Costume College. I'm still adding things to this costume (it's currently hanging on my wall waiting for me to finish sewing more trim) but I'm very glad that I wore this my first time attending Costume College. I actually ended up sewing quite a few corsets (and stays). Firstly I finished up my blue corset, which really didn't fit well but it did it's job for a while. I made a pair of Regency half stays, 18th century stays, and a new Victorian corset (which fits and is super comfy, for a corset). This year I had the opportunity to work on several fun short films, two of which were Star Wars films. I learned a ton about working wardrobe and had so much fun on these projects. Set days are seriously the best. This next one isn't something I made but I feel is worth mentioning because it's impacted my sewing a lot, but I got a real sewing form! I love working with it and it's a million times better than my home made form. It served it's purpose for the time, but it was time to upgrade. This year I discovered one of my now favorite era's, the 1840's. I think it's all of the petticoats used to create such a full skirt silhouette that I love so much. But it's really a fun era and is actually pretty simple compared to a lot of other era's. And my last one is something that I haven't blogged about yet, but if you've been following me on Instagram then you know about the 1780's Polonaise I'm currently working on. I started drafting the mock up (which is getting close to finished), have the petticoat close to done, and have already ordered my shoes from American Duchess. I'm so excited for this because it's an era I've wanted to venture into for a long time but never got around to. This is the part of the blog post where I usually list out half a dozen or so costumes that I'd like to do in the new year but usually don't actually make. This year I'm going about my 2017 plans a bit differently. I'm not going to make a list of costumes I hope to make but instead list out some more general area's I'd like to learn and expand on. Technical skill - I want to learn how to drape in a more professional way and eventually be able to create costumes for any size. 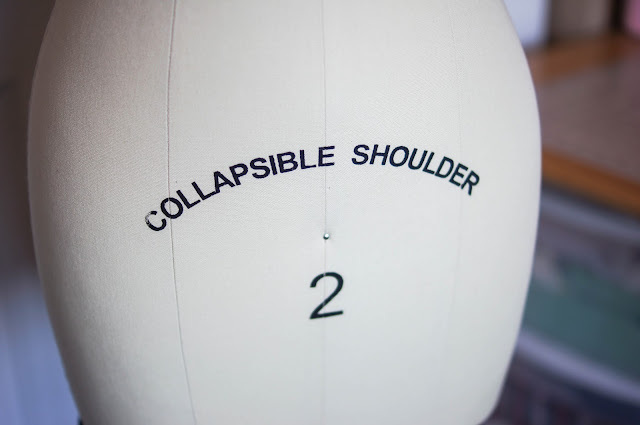 I've already begun learning some basic draping skills and this is something that I really want to learn this year. Victorian - I really love this era of fashion (all 60 years of it) and want to make more garments from this piece of history. I really need to make a new set of undergarments (drawers and chemise mostly), which I'll probably end up working on this year. 18th Century - I'm finally delving into this era and even though I'm only at the mock up I'm having a ton of fun with it! Edwardian - I already have some mental plans for an Edwardian ensemble and I've just barely begun the mock up for the corset. Hopefully this ends up being an era I get to work on this year. 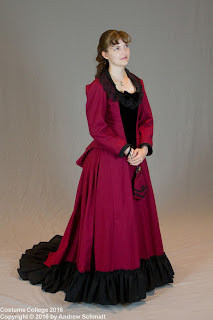 Regency - I may end up making another Regency dress this year as well, I really like wearing this era. Film - I'm not sure what's in store for me in regards to working wardrobe for any films next year, but I'm hoping I'll have some opportunities again. In any case, I'm going to continue learning the skills that are required for any future costume design rolls I may get; concept sketches, drafting, construction, etc. Cosplay - I really, really, really need to make my Rey costume (still). The fabric is literally sitting in my closet. I'd also really love to do a Jyn Erso cosplay, but that one's a little bit more complex. Those are really the only two I have in mind at the moment. Goodbye 2016, it's been fun. Hello 2017, I'm ready for you. It's interesting that you mentioned draping; that was something I really wanted to learn at Costume College. You've kind of got a lot on your plate, that's pretty much any dress between the year 1770-1920.
lol Yeah, we'll see what actually happens this year. I just keep coming up with more costumes I want to make, but there's not nearly enough time (or money) to do them all. Hi there! I’m Tiana Blanchard, Costume Designer and Seamstress with a passion for reproducing historical dress. While I dabble in costume design for every genre, I have always loved historical dress and have special love for the 19th century. In addition to sewing I enjoy drawing, reading, and big cups of tea. Thank for stopping by!